When you have a set of plays to review, it is often tempting to look for common themes between plays. In early autumn, as it happens, two plays came along with not only shared the theme of pubs, but were also very heavily themed around the number two. More by accident than by design, the two plays have a lot more in common besides. So let’s get right to it. The Gala Theatre are continuing their in-house productions with another classic, Jim Cartwright’s famous story of a night in a working-class pub. This is a safe bet for any theatre to choose (more on this in a moment), but Two is a safe bet for a good reason. It’s lots of little stories of snippets of people’s lives, all played by the same two actors. Some are funny, some are tragic, and one or two where the bar staff really ought to intervene. But it’s a busy Saturday night, and besides, the husband and wife who run the bar have their own problems to keep them busy, and it’s not their constant bickering and put-downs throughout the evening. That is just their way of distracting themselves from something in their past they can’t ignore, however much they might want to. All you really need for Two to be a success are two capable actors who can play all fourteen characters convincingly (although I did once see a student production who played it with fourteen different actors, somewhat missing the point of the title). Luckily, the Gala can call upon Christopher Price and Jessica Johnson, who were both naturals for this. But this isn’t quite a paint-by-numbers production. Two was originally intended as a small studio piece and it’s not a straightforward play to scale up to a bigger stage. In a fringe-scale venue it’s treated as normal that there’s no set and virtually all interaction with props are mimed, but in bigger theatres expectations are different – but a fully naturalistic production with two actors is impossible. Director Tom Wright, I thought, struck a good balance. The bar looked like a real bar, but the drinks served were imaginary ones, most of the time going to the unseen customers mentioned in the script. By doing this, he gave a production that fitted the theatre but still kept the semi-abstract nature of the production needed for it to work. The only thing I wasn’t quite taken in by was the lighting plot, which I felt was a bit over-designed. Changing the lighting whenever we moved on to a new story with new characters was fine, but the additional cues within these stories didn’t seem to serve any purpose and got a little distracting. But that’s my only criticism of another Gala production that did justice to a great script. Should the Gala Theatre be so heavily reliant on reviving these classics? Two follows Educating Rita and Talking Heads, and whilst these were both successes, they too were ultra-safe choices – and Teechers, coming early next year, is another ultra-safe pick. I am beginning to hear some grumblings about it, and I see where they are coming from, but I also see that a more adventurous programme is also a more financially risky programme. With the Gala’s management so heavily integrated with Durham County Council, big decisions like that are really in the hands of people higher up in the council. However, it should not be forgotten that there are plenty of people who just want good production of great plays however long ago they were written. (And, I have to add, I prefer this to the era when the Gala produced endless originals based in Newcastle by a management who thought that Durham equals Newcastle.) This is a debate for another day – but should not let this devalue what the Gala does at the moment, and their production of Two does the job well. I t’s one of the steeper coincidences in theatre programming – but even though Two Pints has a lot of things in common with Two right down to the number, the route this play took to reach the north-east is completely different from the famous Cartwright play. 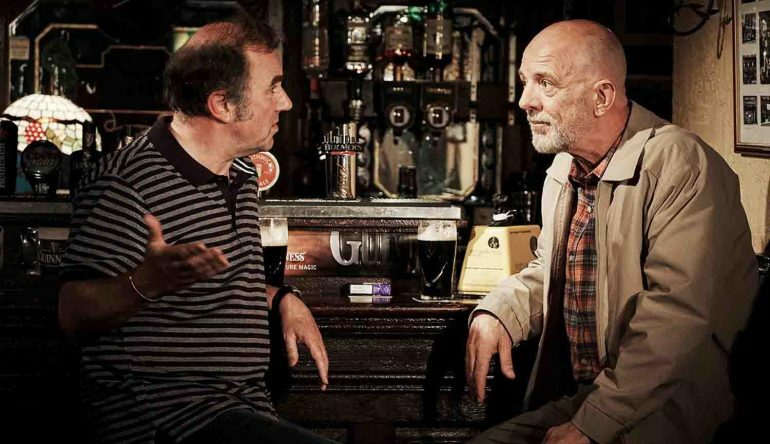 Written by famous Irish author Roddy Doyle, this has been with the Abbey Theatre (Ireland’s equivalent to the UK’s Royal National Theatre) touring pubs in Ireland. Live Theatre took this on and began with the three-week run there, but it then begins a UK run of pubs, starting with the Peacock in Sunderland. The Peacock is quickly emerging as a cultural venue in Sunderland, and for all the praise I heard of the set of a pub at Live Theatre, I’m glad I saw this in its most fitting setting of a real pub. If there’s one thing I learnt from this play, it’s that the one thing that Britain and Ireland have in common is two men meeting in a pub to talk shite. Nigella Lawson and parking attendants keep cropping up in their conversations. Or Nigella Lawson as a parking attendant. And various other topics. But the story here isn’t really what they’re talking about, but what they’re not talking about. Because the car park one man mentions is a hospital car park, and he’s using it to visit his father – who clearly isn’t going to be leaving. All these other subjects are a distraction. Except when they can’t. So universal is this, a conversation like this could easily have been one of the stories in Two. But there is one difference, and sadly not a difference for the better. In two, stories like these were snapshots – you didn’t need any more, you knew where these stories had started, and where they were going. Two Pints, however, is a snapshot that lasts two hours, where very little changes. There are some interesting themes that crop up, such as an underlying anger over a middle-class world where they see people like the hospital doctors leading lives they are left out of. But there wasn’t enough to justify this length including two intervals, and large stretches of the play ended up failing the “get on with it” test. The most emotional moments of the play, however, were handled beautifully. When the inevitable phone call from the hospital comes, out comes the inevitable brave face to hide what’s being felt inside. It’s those sorts of things that make me feel a little bad about not sharing the enthusiasm of everyone else; a play that sells out the entire run at Live Theatre and most of the run at the Peacock is doing something right, and I guess this is a play that resonated with a lot of people. It is fair to point out that Two Pints began as a series of Facebook messages and the stage adaptation came later; I can see this working well in its original format so it’s maybe unfair to judge the story too much on pace. And the play does a good convincing job of depicting moments like this going on all over the world. Other plays may do it better, but it still clearly strikes a chord with the people who see this. This is a very late review, so apologies for this. I group together most of my reviews into articles with a similar theme, but this one slipped through the net. But now that I’ve just reviewed the next Gala play, I’d better catch up on this one too. As I’ve already said Talking Heads is about as safe a bet as can be. Originally a series of six half-hour monologues made for television, it has gone on to be one of the seminal works for the stage. Unlike most monologues written for the stage, where there is at least some visual element to it, this famous set of six monologues works entirely in the script. The Gala production chose three of these: A Chip in the Sugar, a man with mental health problems being pushed out of his elderly mother’s life by another man; Bed Amongst the Lentils, a vicar’s wife bored of a life as an accessory of her husband turning to drink and adultery; and Soldiering On, a widow who is conned out of her life savings and home by a scheming son. None of these things are stated openly – all the monologues rely on self-delusion of these individuals who, either deliberately or unknowingly, leave out important facts of the story. It is for us to notice what’s really going on, and that is what makes the stories so timeless. However, I stand by the reservation I gave in advance of the play: I’m not convinced Talking Heads suits the stage that well – at least, not this kind of stage. The television original was literally just talking heads, with close-ups of the six actors’ famous faces throughout almost all of the programmes. That’s something you can’t do in theatre. I can see a similar effect being achieved in small theatres with a closeness to the actor in an intimate setting. Or, if you’ve got a massive theatre, you can afford to cast big-name actors and appeal to people who want the chance to see them on stage. The Gala is stuck in an unhappy medium here. They did their best to make it look like a stage play, with mini-sets created for each of the stories and moves to make it look more natural, but with the entire story conveyed in the words, it does look a bit like moves for the sake of moves. That said, I do think that the Gala did the best possible job they could have done for a script whose natural home is television. Everything that matters is done right: the characters are properly understood, and the emotions that come with the story come across well. Particularly commendable was Judi Earl in Soldiering On – for all her naivety over her scheming son, the grief for her husband is real and that surfaces every time he or his death comes up. There’s not much to be gained from dwelling too much on how well Talking Heads works for the stage; that is a one-off debate on a production that has come and gone. At some point, there will need to be a discussion on whether the Gala should step out of its comfort zones and take risks. But all the the productions so far did the plays justice, and these are plays that a lot of people want to see. That should not be forgotten.